Cruisers & Sailing Forums - How big a boat for swing keels? How big a boat for swing keels? First time posting here. I couldn't find much on this topic in the archives. I have a 19' O'day (not the Rhodes type) Which I chose as my first boat because of its stability and safety (7'9" beam). I have a mooring in a harbor that limits boat size to 28'. I would like to be able to continue to trailer my boat in and out of the harbor beginning and end of seasons and if i want to put in somewhere else. What is inspiring this move is that we just completed ASA 101, 103 and 104 in the Caribbean. I am wondering how large a boat is realistic to have that has a swing keel, and if there are particular brands that i should be looking for a reasonably stable/safe boat. Currently we don't go very far and always return to our mooring at end of the day, but we want to be able to actually travel to other harbors like Boston, Nantucket, and others. (Cape Cod area). Re: How big a boat for swing keels? just guessing but don't you have to have a "wide Load" sign on anything larger than 8Ft beam? I have laguna 25 that trailers great, and, like you, I am eager to be able to drag it all over. Really sweet to launch, too. Have seen other threads that talked about 30 to 32 ft boats, with the swing keel. Im sure you'll get plenty of answers, as their are very many knowledgeable sailor on this site. Welcome aboard. Joel, I don't know rules of the road and "wide load" rules at all in terms of trailering. Never thought of it before :-) I guess that is another factor to consider. I have only three miles to get to the local mooring, but otherwise anything would be a considerable distance. I am wondering how large a boat is realistic to have that has a swing keel, and if there are particular brands that i should be looking for a reasonably stable/safe boat. You could also look at centerboard keels (hope that's the correct English term for it). Maybe I'm misunderstanding you, but most (well maintained ;)) boats are reasonably safe. Not sure what it is exactly that makes you feel confident a boat is safe? It is hard to answer without knowing your budget but assuming you are talking of a new boat the one that fulfill your criteria of coastal cruising at reasonable price is the Jeanneau Sun Odyssey 349 with a swing keel. That is not a normal swing keel but one that has all ballast on it and provides the same stability, pointing ability and performance of a deep keel. For more information you can look at my blog (use the search engine). There is plenty information about that boat there including about sail tests. Looks like 8'6" in most states, for most vehicles, on most roads. Thank you for that recommendation. The one limitation I have is that my mooring and the whole marina is limited to 28' length. And you are correct, that I did not provide enough information. I am definite looking for a used boat. Perhaps the safe/stable aspect is more of an issue with smaller boats. There were some boats that I looked at when I purchased my first boat, that just seemed much more tippy than others. Just stepping on the boat caused a much bigger shift from side to side on some boats we looked at. Weight, balast, and beam each had an impact. Maybe I am wrong, but I expect boats used for racing tend to give up some stability for speed. Joel pointed out however, that a wide beam in a longer boat might create challenges in trailering, so that is an interesting consideration I need to look into. And you are correct, that I did not provide enough information. * I have no clue as to your local laws about max size, drivers license needed etc. when you trailer a boat. In the EU (except UK), max width is 1,55m (8.3'), max. length (and this includes the mast!) is 8m (26'). Then you can dream with this one:biggrin:. They have a dealer on the States and an American friend is probably going to buy a 24ft (a more sportive boat) but for what you describe a 27ft would be more indicated even if I don't believe you will find an used one on the States as it would be possible in Europe but who knows? 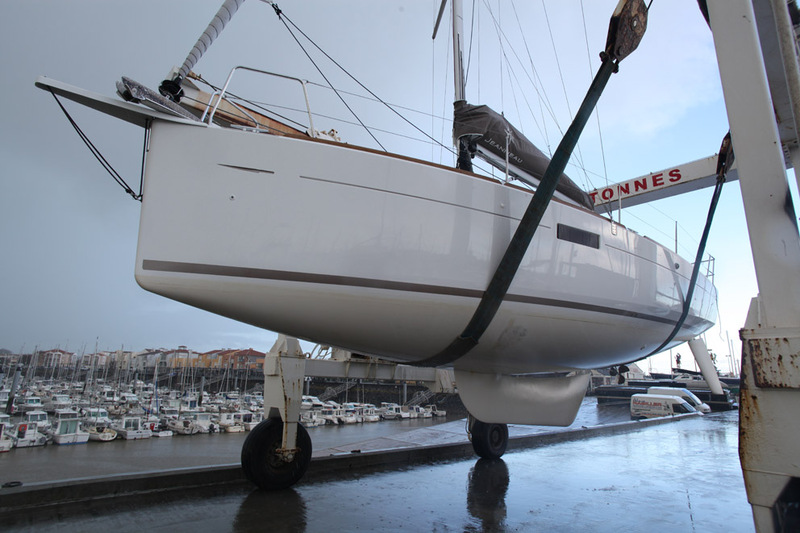 The boat has a swing keel similar to the one on the Jeanneau. They have a great stability for the size and are used offshore but not for extensive passages. My buddy has a Catalina 25. It is pretty stable, no problems stepping aboard. The swing keel makes it a lot easier coming in and out of the marina, as well as launching. It pulls behind a truck well and is within all regulations for Canada trailering. Just make sure your truck is capable and set up properly for towing. I'm sure there are many other boats that will work well but my only experience with a swing keel is this one. Corsair F27 trimaran folds to highway legal width, sails better than a swing keel mono, sails level, but accommodations not as good as something like the Catalina 25 and will cost more. In your "neighborhood" - near Boston, MA - and started a very similar exercise two years ago; looking for the right trailer sailor. Just before the holidays bought an Ericson 25 on a dual axle trailer; 50 state street legal, retractable C/B (2' draft C/B up, 5' draft down), 5400# displacement w/ 2500# lead in the centerboard trunk (C/B does not act as ballast), sleeps 4, enclosed head, galley, etc. Did a lot of research, but also found some great sites where someone else had done more (and better) research. Waiting for some warmer weather to pull the shrink wrap and start commissioning for my first season, but PM me if you have questions or want some of the background that steered me to the E25.